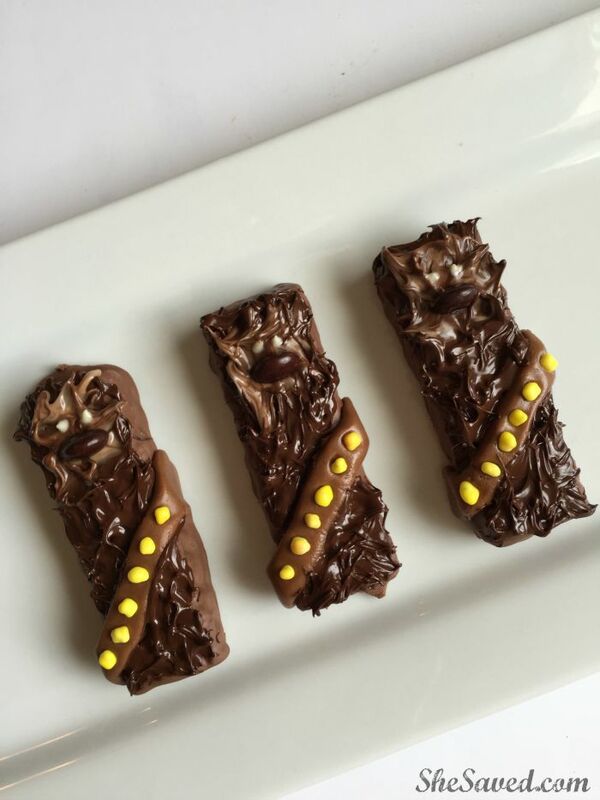 Chewbacca is one of our favorite STAR WARS characters and my kids think that these Chewbacca Snack Bars are just about the funnest thing ever! 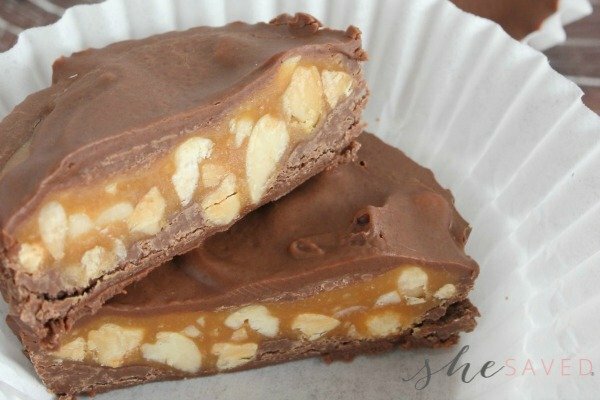 This is a fun treat that you can make for the kids and it is also one that they will enjoy helping you with. In fact, this would actually be a fun STAR WARS party activity — you could have each kid make their own Chewbacca snack bar! First, unwrap and cut your tootsie roll in half lengthwise. Pull and flatten one half of the candy until you have the shape of Chewbacca’s belt. 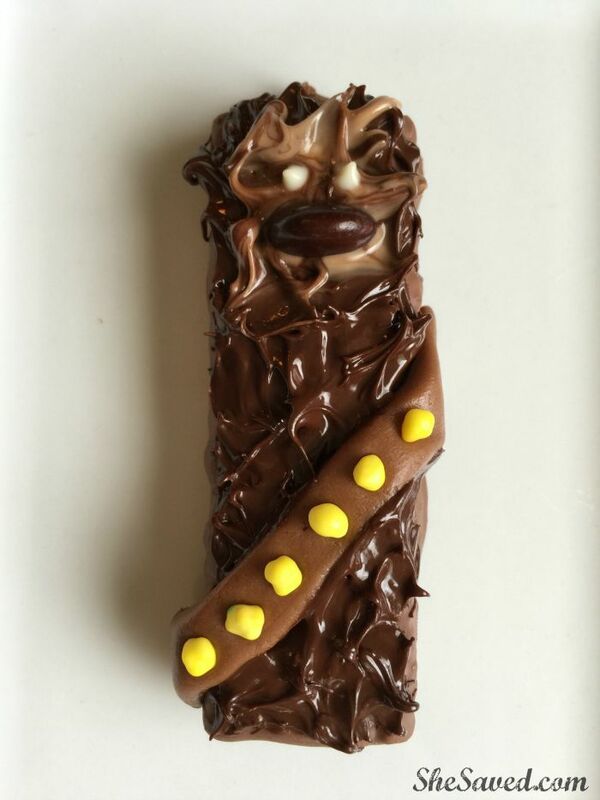 Unwrap a granola bar and place Chewbacca’s tootsie roll belt diagonally across your granola bar, pinching it down on the sides to secure. Stick the yellow Nerds candy in a row onto his Tootsie Roll belt. Unwrap three chocolate kisses and place them in a small microwave safe bowl and then microwave them on high for 30 seconds or until just melted enough to be stirred with the tip of a knife. You do not want your chocolate liquified. Now spread the dark chocolate onto the top of your granola bar lifting up with your knife to form peaks resembling fur. Place one square of white chocolate in a small microwave safe bowl and microwave that on high for 15 seconds or until just melted enough to be stirred with the tip of a knife. Do not liquify the chocolate. Carefully cut your brown M&M’s in half. This will be Chewbacca’s nose. Place it in the center of the light brown facial fur. Last, dip a toothpick into your melted white chocolate and dab two white eyes onto your granola bar. 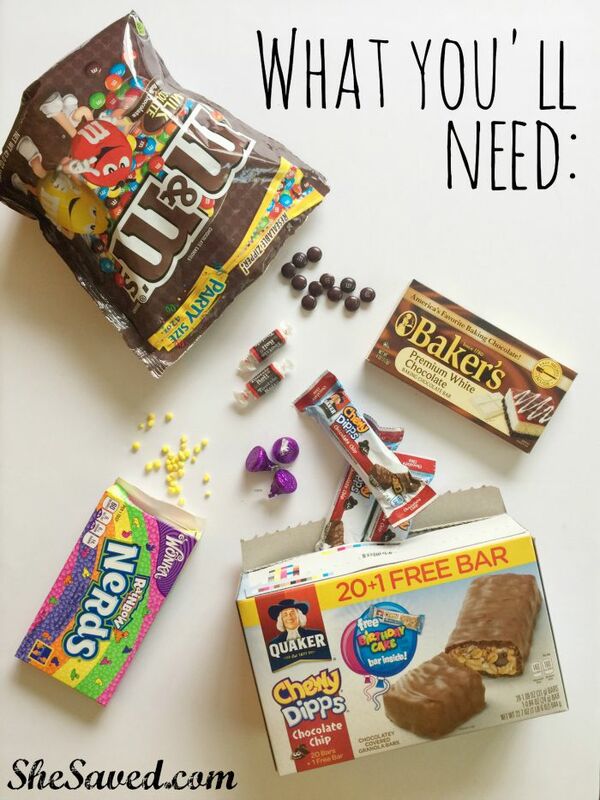 Enjoy your adorable and delicious chewy Chewbacca snack bar! « 1/2 off Scarf Sale!! Scarves as low as $3.99 Shipped! This is adorable! 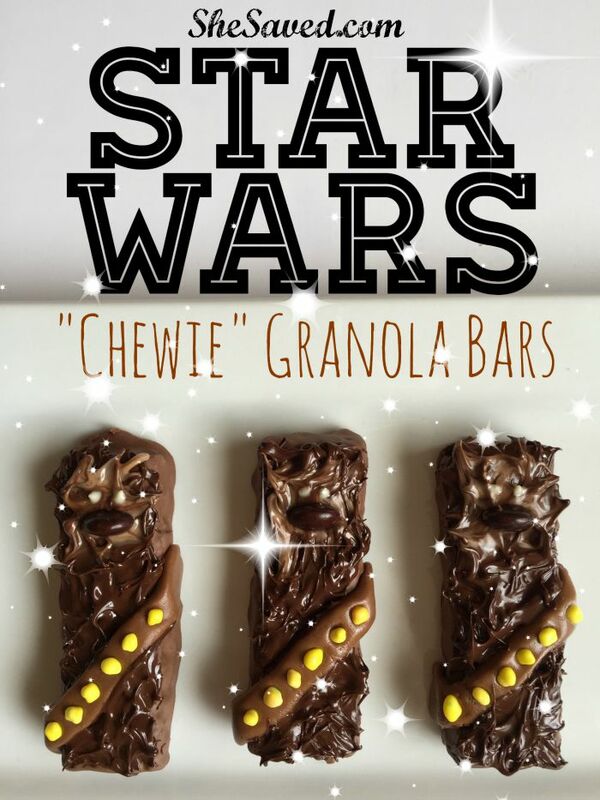 My son is having a Star Wars themed birthday party this year and I will definitely be making these for the table! 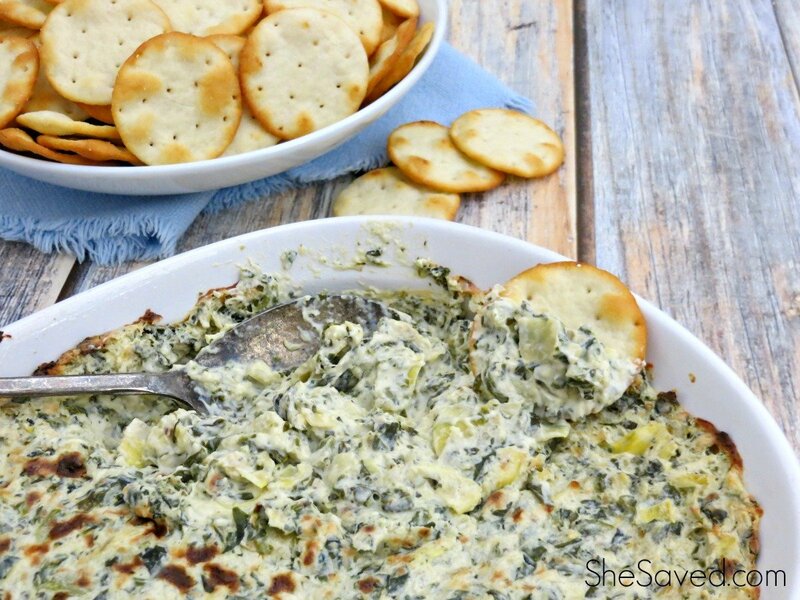 What I love the most is that my kiddo's can make them with me! Thanks for sharing! You are so welcome Lissa... aren't they fun!? We had a Star Wars themed party a couple of years ago, and hopefully I can get the rest of our party ideas up so that you can see those too, it was such a fun party! !